I may have enhanced the sense of stickiness with my selections, but I don't think so. A choice of nothing but Lawrence's forks and spoons would be more distorting. 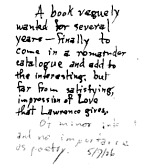 Maybe for Lawrence, everything is a love poem and a complaint, all at once, even his novels. Especially his novels. He's a novelist who loves the moon, too. The moon is always there, looking over treetops, into windows, reflecting in lakes and rivers. Half of Women in Love is about the moon. I also had problems with that "slept till dawn" until I stumbled at the end of the first line and had to start over again. "A White Blossom" is good, but "The Collier's Wife" looks better. Lawrence understood collier's wives pretty well, I think. Half of Sons and Lovers is about a collier's wife. These poems are contemporary with Sons and Lovers, by the way. I wondered which collier's wife came first, the poem or the novel, or if they are somehow one and the same. I'd have thought the poems would also be full of flowers, then. The flower imagery in Sons and Lovers is pretty powerful and runs all through the book. How much Lawrence poetry have I read? As much as you've put into this post. Flowers, yes! Scrolling through the book, not as many flowers as moons, but still lots of flowers. One thing always want to know about a writer, especially one with a strong voice, is when the voice appears or is invented or whatever the process is. With Lawrence, boy, he is Lawrence right away, purely himself, for better and worse. Ouch for Mark Justin, too! I expect Lawrence will survive both attacks... Sometimes lesser poems must be written because they are bridges to something else. And a poet can often be in love with those bridges because he/she knows it's the real path elsewhere. There are some unfortunate bits--that first quote and the "heart of despair"--but I would say this is completely recognizable Lawrence. I admire some of his poems and his bravery in teetering on the trapeze line over a sea of too much feeling. It reminds (I think it was here, hope so!) me of "Poetic Meter and Poetic Form," how Fussell's students had no idea what to make of Lawrence's "Piano." I don't know if "Piano" is in Fussell, but it's one of the poems which floored students in I.A. Richards' Oractical Criticism. In some ways, I think it was unfair of Richards to put it in without context: it's very hard to tell a poem about sentimentality from a sentimental poem. Well, I plan to keep reading Lawrence's poems. They are a good challenge for me, in good part not because they are bad or in bad taste but because they contain many signifiers that they are bad or in bad taste. Gives me something to fight with, something to do. Having no idea what to do with a poem - yes, outstanding!